In early October I was in Colombo, Sri Lanka to speak at the Computer Society of Sri Lanka (CSSL) National IT Conference (NITC 2018). The conference put speakers up at Hotel Samudra. This is a training hotel of the Sri Lanka Tourist Board, with students training in running of a hotel. There are only ten rooms in the hotel. The students line up outside each morning at 8am, in their perfect white uniforms for the raising of the national flag and anthem. This is not something you see in the average hotel. The rooms are large, with balconies overlooking the beach, but could do with some maintenance. The students are very keen to provide service, but are students. This was a very different atmosphere to an impersonal hotel. 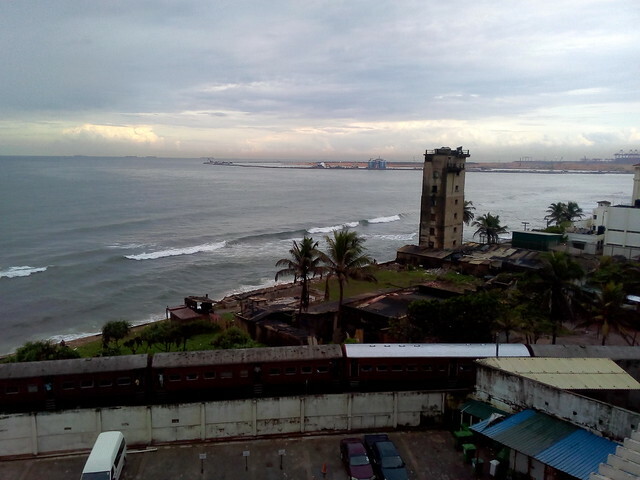 The train from Colombo to Galle runs between the hotel and the ocean. This would be a delight for train spotters. Also the new Colombo port is visible in the distance, past Galle Face. On Friday night there were fireworks at the Galle Face, which I could almost reach out and touch.